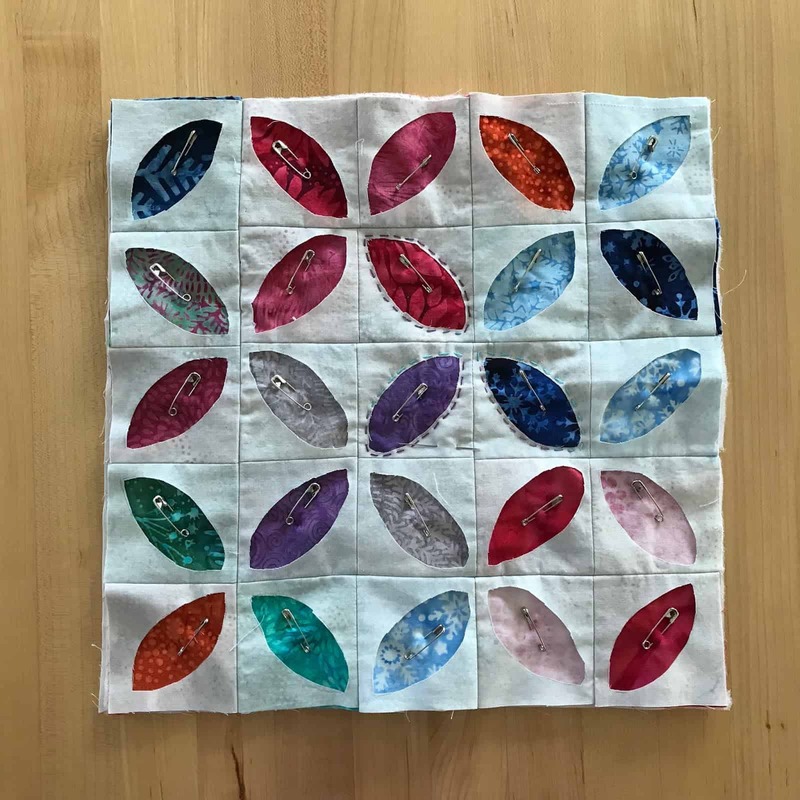 This fun project is a combination of work for 2 groups. Island Batik provided the fabric and the International Association of Quilters gave me the pattern to work up as a project lead for this freebie for members. 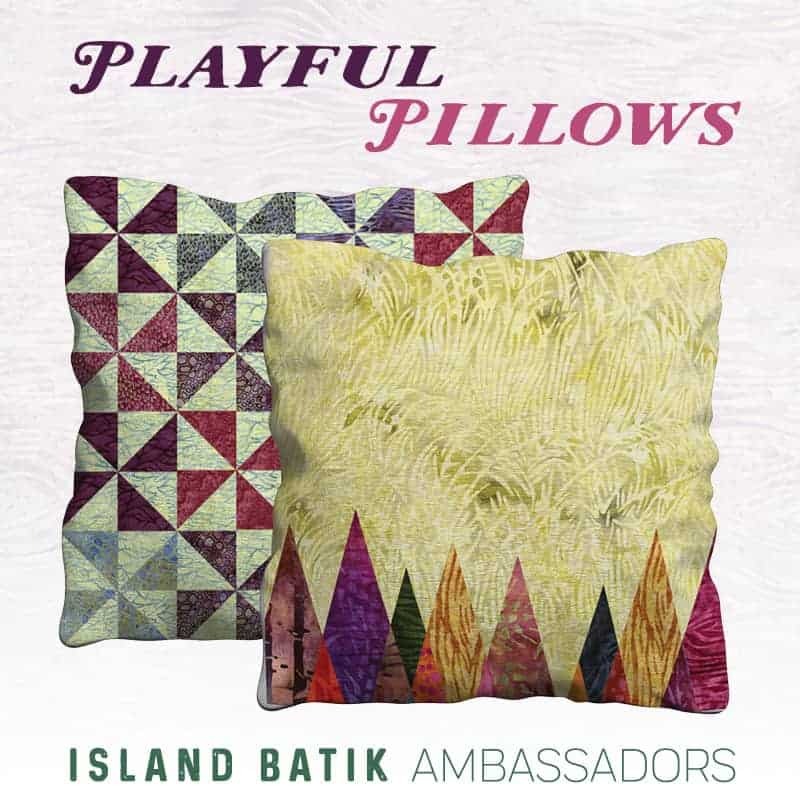 The challenge for Island Batik this month was to make a pillow. I thought the project from IAQ was just perfect. First up – picking fabric. First, I laid them out in what I thought was a pleasing order. Per the instructions, I sewed background and “peekaboo” fabric together. Here is what the back looked like. 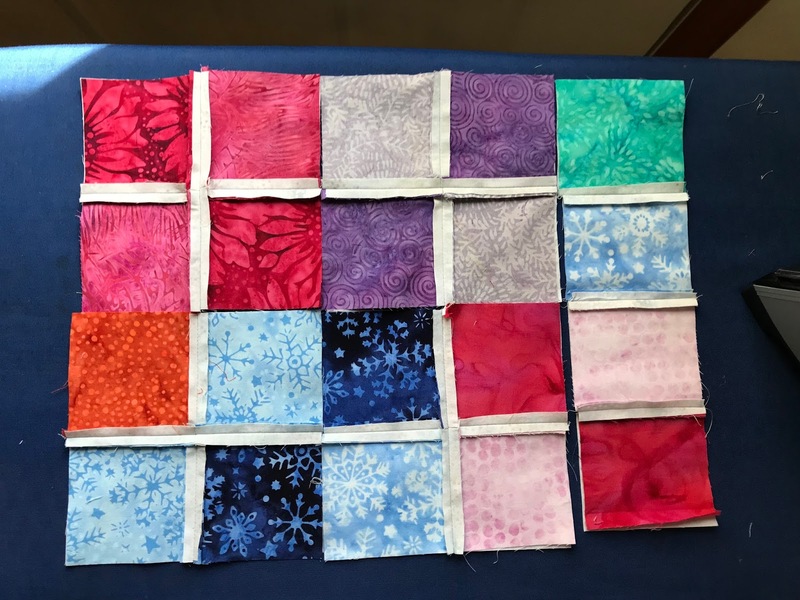 Then I decided to add another row, in order to make a square pillow. I auditioned a few of my scraps, and then added the rows like I did before. 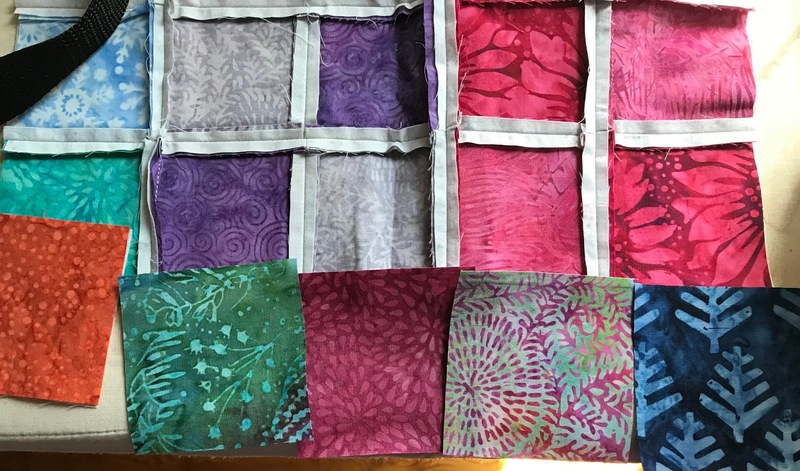 My fabric choices were dictated by which Island Batik fabrics I already used and had some scraps. This is my first year as an ambassador, so I am being a bit conservative with my larger pieces until I have a sense of what I will need through July. Mark the orange peel, lightly, on the fabric. I am partial to Sewline pencils, but whatever you do, use a light touch. 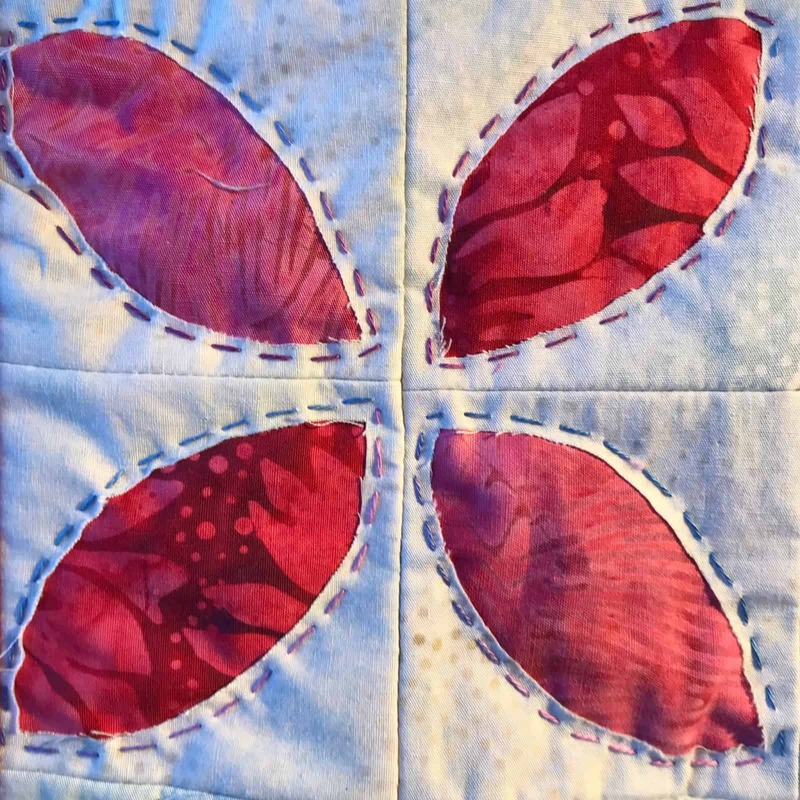 You can see the marked orange peels on the assembled quilt. I cut on the line – so no remnants are left behind. Remember: what you see is what you get! 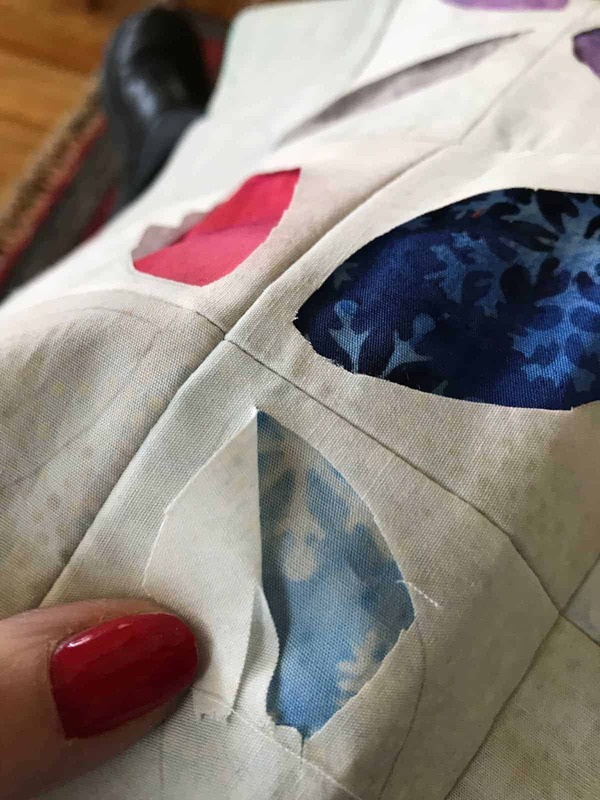 Think about seams and quilting through them later – give yourself 1/4″ near the seams to save you some difficulty in quilting later. 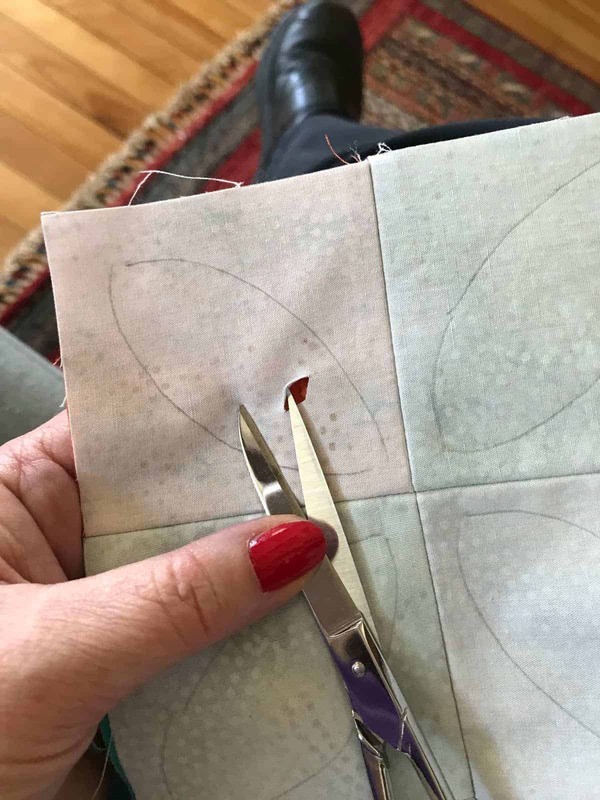 I make a tiny slit first, cutting very carefully the slit in the center of the top fabric. Then I cut towards the side and around, which will reveal the orange peels. 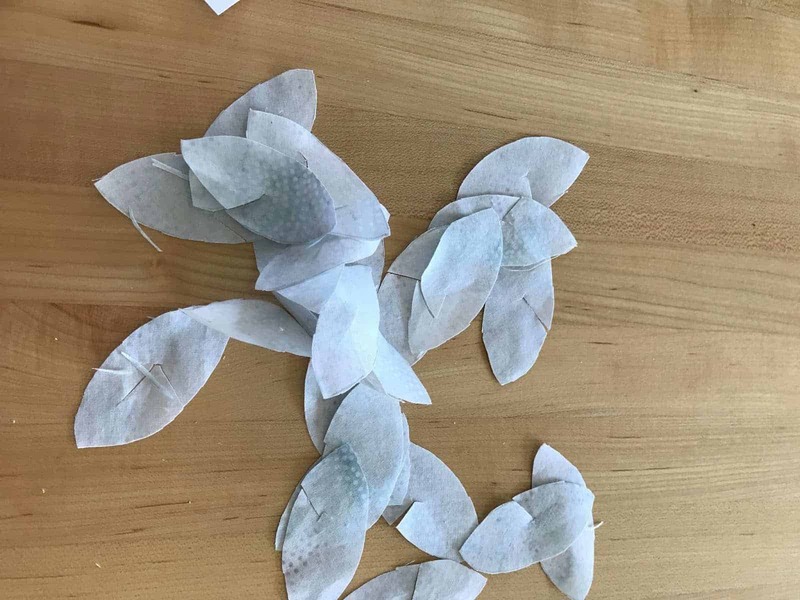 Trim nicely, as these edges don’t get turned under. Some reverse appliqué does, but this pattern did not call for that. The next step is to layer with batting and a backing, I used safety pins to hold it together because I was hand quilting. Since mine was going to be a pillow I didn’t worry too much about the fabric I used in the back. 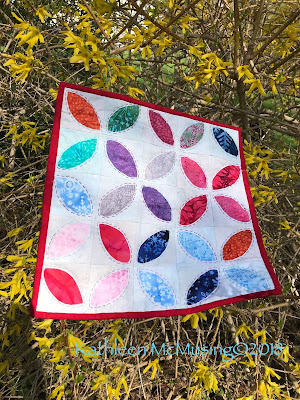 I quilted with a variegated 12w thread from Valdani. I tried to get my stitches more even on the front than on the back, again knowing this was going to be a pillow. HINT: use a needle that can be threaded with the weight thread you will use AND can easily go through your layers. 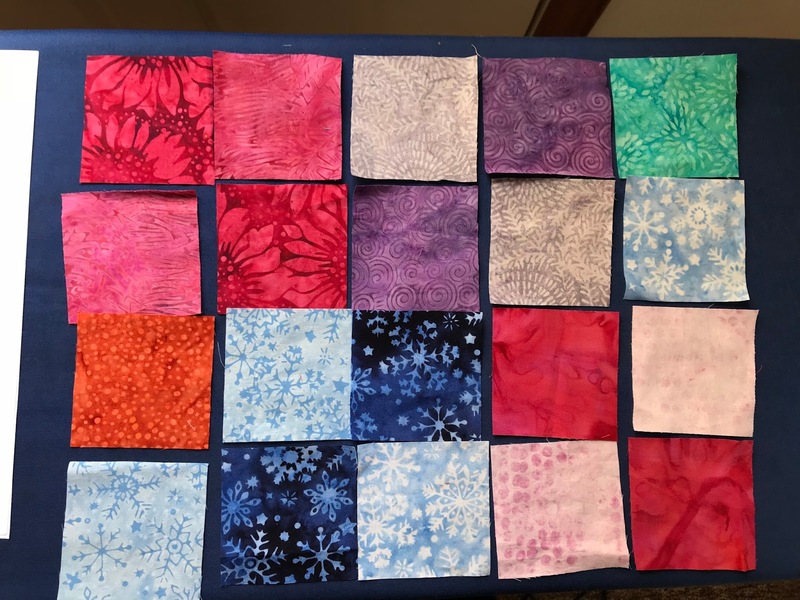 I had to try a few until I found one I liked (remember batiks are a little harder to quilt but the right needle helps). 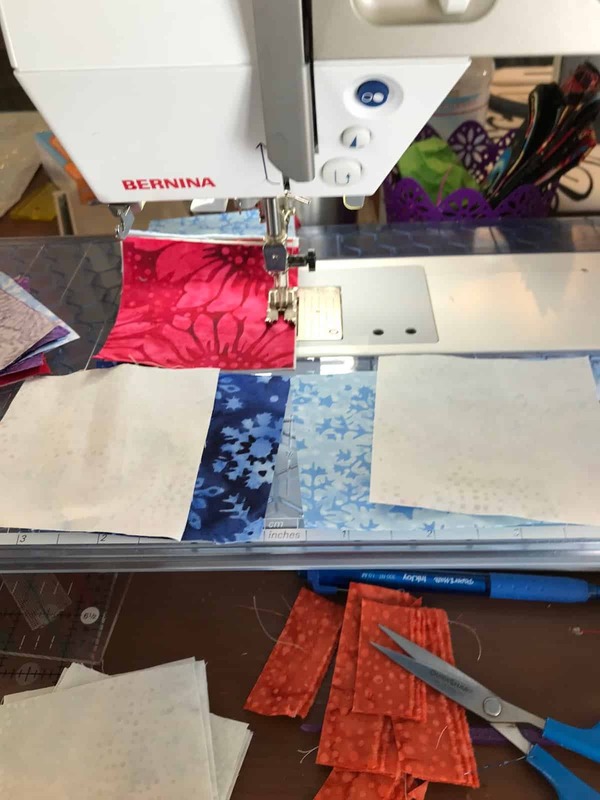 I decided to use the envelope method, so I first cut two pieces that were about 12.5″ x 15″. I turned one edge on each down, pieces now measuring about 10″. I then top stitch along each edge. Sandwich on and sew on the binding to the front. Hand sew to the back. HINT #1: I like bigger pieces so “the belly” of the pillow doesn’t peek out! HINT #2: Backing and Binding are sewn together. WRONG sides together for front and back. 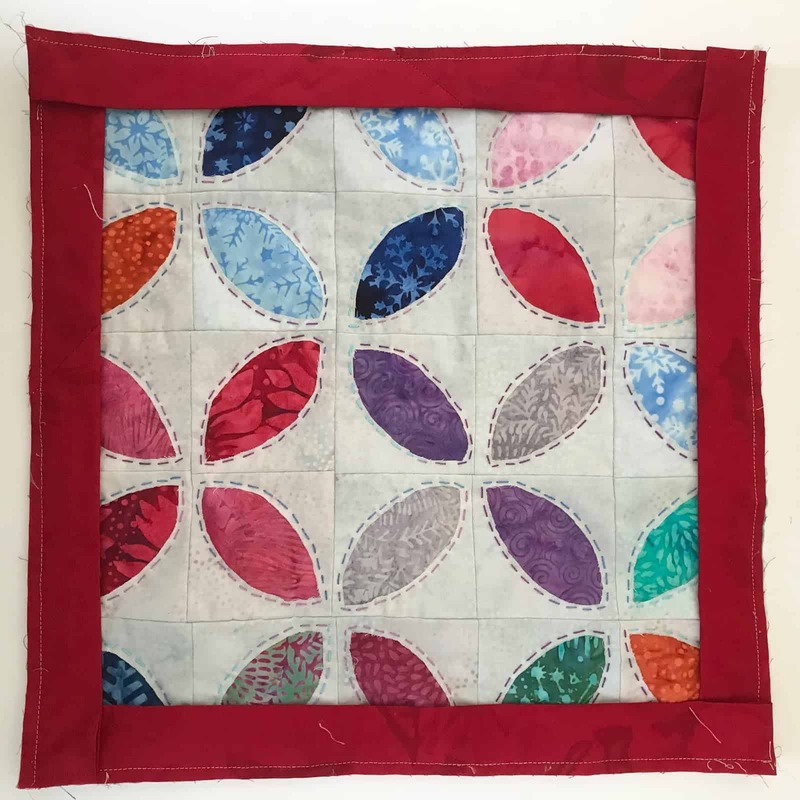 The binding is attached to front and turned to back (like most quilts). A simple pillow insert was made with poly fiberfill. I measured the pillow from the back and made the insert that size (2 pieces cut 12″ square). Sew up on three sides. Stuff and test the insert in your pillow, add more fill or not, close up the insert! Stuff it into the pillow and you are done! Voila – your pillow is done! A class and a plan…. I came to see your X block project and saw this post. What a neat way to do orange peels! Very nice–bet whoever gets this pillow will enjoy it! Thanks Carol for taking the time to comment (especially when on the blog hop!). Love your twofer! Isn't it great when you can turn two commitments into one. Great tutorial for making this pillow. It is truly a gift when 2 can become 1! 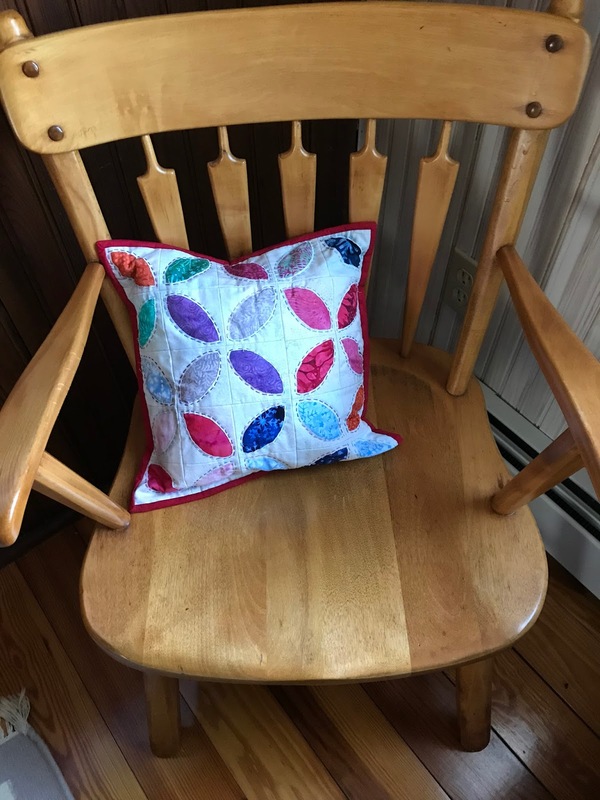 The pillow turned out beautifully, Kathleen! 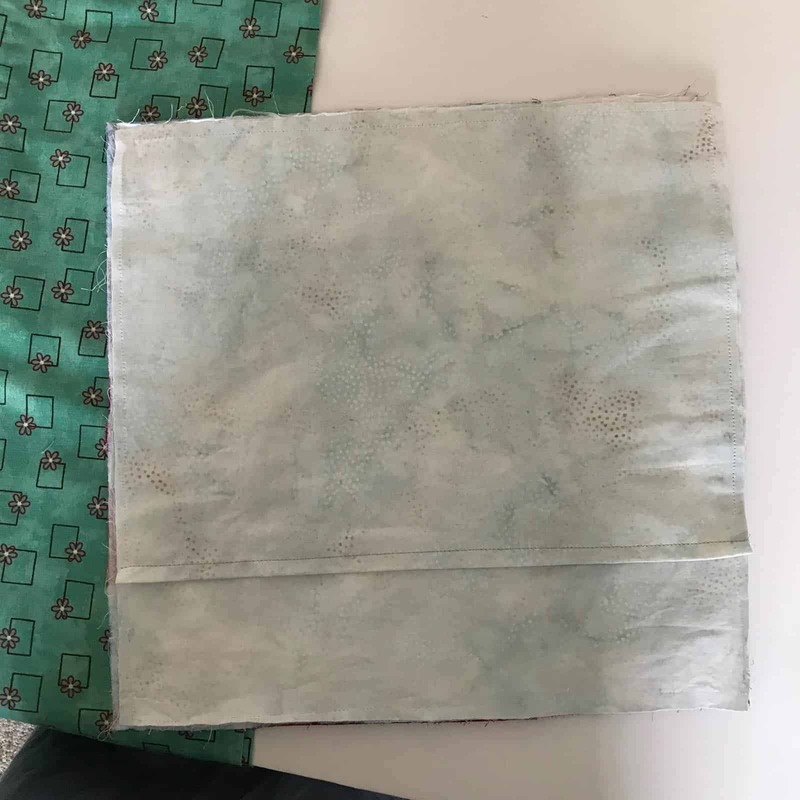 I think a batik is the perfect fabric for this kind of applique project because it has such a tight, nice weave. Thank you, Yvonne. I do love that tight weave when you are doing this kind of a project. Finding a happy needle was harder (and I wish I knew which one it was – too many unlabeled needles!). Thanks for pinning it Roseanne. I think it probably was a Piecemakers Embrodiery – but as you say it was not marked. May still do some investigating and will post if I do. 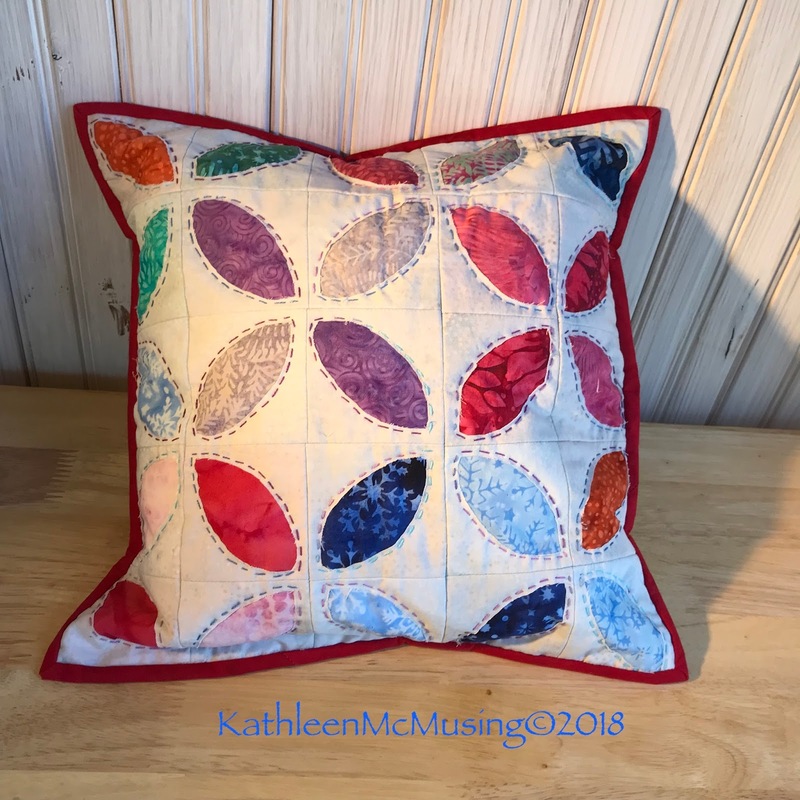 Great tutorial, Kathleen, and your pillow turned out so pretty. I am forever losing needles and it's so hard to find one that's sharp enough to work well but with a big enough eye to be threaded easily. I know! I’d love to know what kind it was. I tried the big stitch needles which couldn’t handle get through the batik. I’m thinking it was a piece Maker’s embroidery but I have to see if I can find the package!! What a neat little project, and fairly quick too! How fun to get two for one! Your pillow is cute, and it's a great way to use up those scraps! Thanks, Wendy. It was so much fun. The I AQ group is strange. I don’t think there’s s lot of activity but I’ll keep watching for it. The scraps are being hoarded so I don’t run out. I don’t think I will but I do worry about it. 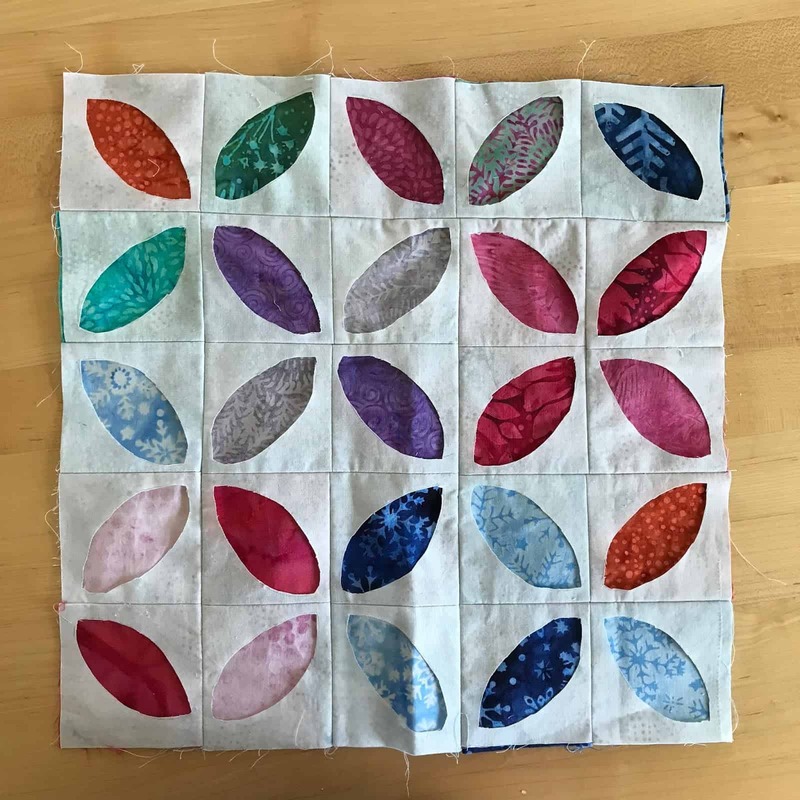 Love the pillow – the hand quilting really makes it extra pretty! Thanks, Pamela. It was fun to do. I haven’t done a lot of big stitch quilting so that was good to try! I love how the red binding frames your new pillow! Great that you got 2fer! Very cute pillow! I've never made my own pillow insert. At the price of the better ready-made ones and the fact they tend to go flat quickly, I just might have to start.